Today I’m excited to welcome David Hayward of NakedPastor.com, where he routinely practices the art of writing graffiti on the walls of religion, for an interview. Through his many controversial cartoons, comics, drawings, and blogs David consistently challenges the status quo in the religious world and most directly within Christianity. 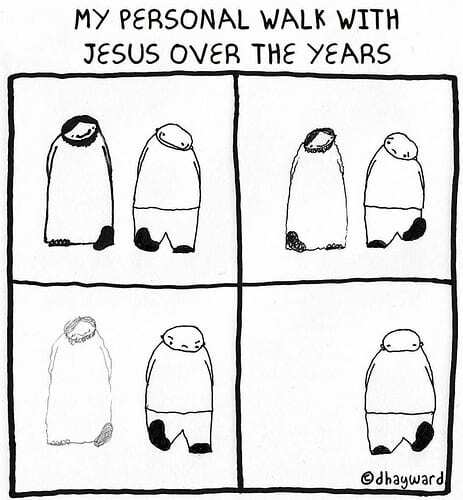 I first found David just before he left the church, when he posted the comic strip below. When I saw it it hit me like a ton of bricks and I knew that this was someone not only going down a path that I well knew, but that cared about helping others do it too. This simple picture embodies my own experience, my story, and it was one more needed confirmation among many that I was not alone and that it would get better. David, for those of my readers whom are unfamiliar with you and your work – tell us a bit about your time in the ministry. How long were you a pastor? What things made you decide to leave the ministry? I have been involved in the church for much of my life. I went to Bible College a year after high school. I met my wife Lisa there. We got married after I graduated. I went to seminary in Boston. From there I went into the Presbyterian Church in Canada. A few years later, in 1987, I was ordained. I served the Presbyterian Church for a while, then Vineyard, then independent, then Vineyard again. I finally left the ministry in the spring of 2010. The thing that finally made me want to leave was feeling constricted and controlled. I guess my blog was getting more popular and my thoughts were leaking out all over the place. It became too much for some of my people to handle. I was also hearing concerns from the people I was accountable to. It just got to the place where the church and I were no longer compatible. I mean the church I came out of. I’m sure there are some churches out there where I would feel more free. But the constriction I was experiencing was finally just too much to bear. What trials did you face as you left the ministry? How did your family react to the news? My family, including my wife Lisa, is totally supportive. They saw and experienced all that I’d gone through with the church and all my struggles with it. It wasn’t really a surprise although it did happen very very quickly. I just suddenly knew one night that I was finished. I texted my wife after the meeting to let her know and she said she was finished too. It was just a matter of a couple of weeks and I was out of there. To be fair, I know I reacted super fast. But things fell into place quickly enough. I just couldn’t spend another week under that kind of ethos. I think the greatest thing I experienced since leaving the church was loneliness. One of the greatest assets of the church is the automatic network of friendships that you can suddenly enjoy. There’s really no work involved. It’s like, “Here are 100 people who are your friends!” It can be that easy. Unfortunately for many this comes at a price, such as the loss of your independence, individuality and uniqueness. Sad to say, but conformity is inevitable to maintain such a network of fellowship. The next thing I missed was the sense of destiny or purpose. While I was in the church I knew every day exactly what I was about and what I was supposed to do. I even had my whole future outlined for me basically. But I left all that. I rejected it. Now I’ve had to find my own path, my own self, my own purpose and vocation. It’s been a challenge. The thing I most enjoyed was the sudden sense of freedom. On the one hand it was incredibly frightening and intimidating. It felt like being flung into outer space. You have to learn how to fly… fly above the borders. It takes a while to learn that. Do you still have contact with any of your former church members? If so, are they angry or what is that relationship dynamic like now? I have no contact with any of the church people. I am friends with a few but they’ve also left the church. There is one family that we see rarely. They were our closest friends. But they were also instrumental in us leaving. We wonder if that relationship will ever be restored. It certainly changed everything. The strange thing is that we fully intended to return to the church one day after the transition was complete and everything was settled, but as usual all kinds of nonsense arose and we were no longer welcomed. We were cut off essentially. It hurt. I got angry and resentful. But I’ve learned how to quickly process those emotions and move on. I hold no grudges. I forgive them all. And I hope they forgive me for leaving the way I did. You and I have talked before about labels. You even did a cartoon a few days after I published a blog on labels. I personally find labels to be an important part of the human conversation, normally we call them adjectives, while you have disparaged their use. Humor me and tell me, as best you can, where you fit in with the whole theological set of labels that are out there. For instance, where would you say you are on the Dawkins Scale? Those categories are built on numerous assumptions. Okay… I’ll humor you… if a gun was put to my head and I had to choose a category I would say “pure agnostic”. But without being forced, the problem with that category as with all of them is that it assumes you are a Deist or not. “God” is in every category. What if the word “God” has become just a label? What if it has lost its meaning? The word is not the thing. When Dawkins says “God” it comes loaded with meaning. What if I don’t subscribe to his meaning? This can’t be explained logically I know. But it can be experienced. I’m looking forward to completing my z-theory that I hope will articulate this for people. Now, currently you assist people in transitioning through faith positions in much the same way that I do (the word I use for this is a Faith Transition, or Embracing Doubt). Tell us a bit about how you help people with this process, and what you find to be the most important aspect of this transition and how we and those we are helping transition approach it. Once people leave the church or organized religion, basically they’re on their own. The impression given is that there are choices to be made: you leave the church and you become a backslider or atheist or another religion, and you do what they do. I’ve found that there are very few resources for people who’ve left the church but want to continue on a spiritual path of their own choosing, without rejecting everything… you know, throwing the baby out with the bathwater…, and who want to find fellowship with others of like mind. So I started another aspect of nakedpastor called http://davidhayward.ca. Nakedpastor is the rock-the-boat site, and davidhayward.ca is the life-boat site. I’m providing resources for people for their own spirituality and also making a safe space for them to meet other people on similar paths. It’s about embracing who you are, your own unique spirituality, and your own way of living compassionately with others in this world. I’ve sat across from a number of pastors and other clergymen to try to explain to them just how poorly the Church is doing at helping the doubters among their flock, and you are exactly right – there are so few resources out there for people just beginning to ask questions about the God they’ve always been comfortable with. What advice would you give to a believer just stepping into this world of questions? First of all, the “believer” needs to conjure up whatever courage he or she can muster because a battleground awaits them. It is expensive real estate and the competition is incredible for the minds of people interested in spirituality. The person needs to be confident that it is completely valid and necessary to question, search and explore. If the confidence is there, the courage, the rest will take care of itself. What is so frightening about questions is that they set you up for massive continental shifts in your thinking. I often compare it to Santa Claus: to even dare begin to ask whether or not there is a Santa Claus undoes years of a wonderful, warm and comforting idea and tradition. It takes the mysterious happiness out of our activities and places them squarely in the human arena. And then it becomes work. So, there’s no easy way to change. Change hurts. I think this is why some of the biblical writers, as well as writers from other spiritual traditions, compare it to death and resurrection. I have a fairly large number of followers that are pastors or church members – and I’d like them to hear from you what, if any, advice you might have for them on how to deal with the doubters among them, where have you seen the Church go wrong when dealing with people that have hard questions about their faith? Too many pastors and leaders see questions and doubts as enemies of the faith or theological thinking, and as a threat to the well-being of the community. Let people doubt, question and explore. It actually is an incredible incentive for intellectual freedom and vitality. Having said that though, we know intellectual freedom and vitality aren’t welcomed in some churches. Perhaps a lot of the church’s negative reaction to questions is not necessarily intentional. Perhaps the church is like an anxious and fearful parent who can’t stand to see their children suffer through some difficult times and want them just to accept the easy answer and get on with it. But you and I both know that this cautious strategy does not turn children into adults. Have you got any final words for us? I want to thank you for this interview. I hope we all can continue contributing to make this world a better place for open minds. Mailbag – Why Did You Leave the Church? Gay Marriage: A Cause for All!